Strawberries are one of my favorite fruits. Really, there are very few fruits that I don’t like, but there are always, always, always strawberries in my house. While I could eat an entire pint of them without thinking twice, I only like them raw. I’ve tried cooked and roasted strawberries a few times and it just does something to the flavor and the texture that I’m not a fan of. The theme for the #FantasticalFoodFight this month was Strawberry Short Cake. I’ve made this a few times before and I knew I wanted to try something different for this month. 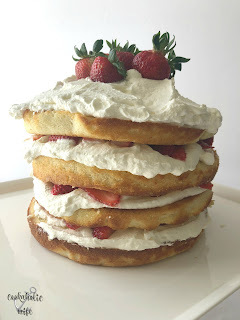 While I’ve had some strawberry shortcake recipes where the cake portion is more biscuit like, I prefer it with a more cake-like consistency, like those little rounds of angel food cake that they put in the store next to fresh strawberries. With that idea in mind, I decided to make a full sized cake instead. The Fantastical Food Fight is a group of bloggers who are assigned a theme each month. The host is Sarah of Fantastical Sharing of Recipes. Bloggers have the option to follow a traditional recipe, come up with something more out of the box, or basically anything they want as long as it follows the themed ingredients/food for the month. I love to make cakes, but layer cakes like this are hard to transport and would not be very easy for me to take into work, so I made this cake a few weeks ago, before I hosted Easter dinner because I knew my family would definitely eat it, and it saved me the hassle of transporting a precariously high layer cake to work for my coworkers. A layered vanilla cake is topped with fresh whipped cream and strawberries. Preheat the oven to 350 degrees or as indicated on the box cake mix. Spray 4 9-inch round cake pans with baking spray or grease with butter and flour. Cut 4 rounds of parchment paper and place into the cake pan. Spray or grease parchment paper. Prepare cake mix as indicated on the back of the box, adding in vanilla extract. Divide cake batter evenly between the pans. Bake cakes in the preheated oven according to package directions, at least 30 minutes. When the cake just begins to pull away from the edges of the pan and springs back when touched, it is done. Let cakes cool in the pans for 10 minutes then turn out onto wire cooling racks, the side with the parchment paper onto the rack. Cool to room temperature, then refrigerate for 1 hour. Meanwhile, cut the tops off the strawberries and slice them into thin wedges. Reserve 4-5 whole strawberries to place on top of the cake. Add to a large bowl and sprinkle sugar on top, tossing to coat. When you are ready to assemble the cakes, remove from the refrigerator and pull off the parchment paper, returning the cakes to the wire cooling rack. Combine the heavy whipping cream, sugar and vanilla extract in a bowl or in the bowl of a stand mixer and whip on medium high to high speed until soft peaks form. Use a sharp knife to level off any uneven layers of the cakes. Place the first cake onto the serving dish and top with a dollop of whipped cream. Spread the whipped cream to the edges of the cake. Use approximately ¼ of the whipped cream. Arrange a thin layer on strawberries on top, using about ⅓ of the mixture. Repeat with the second and third layers of the cake and strawberries. Place the final layer of the cake on top and spread the whipped cream over it, either smoothing it or leaving it shaped into a soft peaks. Place the reserved whole strawberries on top. Refrigerate until ready to serve, then slice into pieces. After baking, the cake needs to cool in the refrigerator for 1 hour. If you were feeling more ambitious, you could make your own vanilla cake from scratch to use in this recipe. I chose not to because I had a lot of stuff going on the day before I hosted Easter and I was leaving for 4 days in Vegas just a few hours after all of my family left. Whipped cream as a frosting on cake is one of my favorite things ever. It does require more work as the cream isn’t stable enough to hold in warm temperatures, but if you have enough fridge space or a family who likes dessert first, it’s perfect. 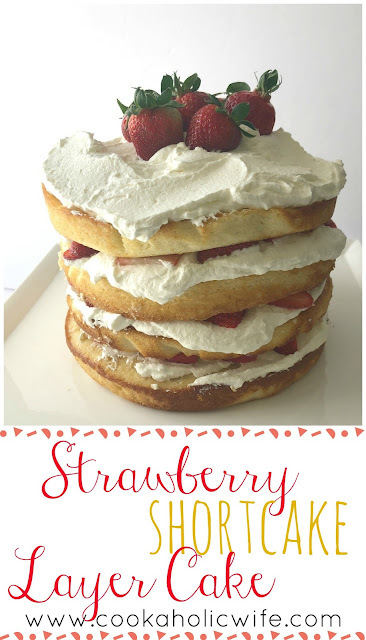 The strawberries are sweet and the cake and whipped cream are light and fluffy. Really, what more could you want from a dessert? Unfortunately I wasn’t able to get any pictures of this cake when sliced into pieces, but as any bloggers or baker/cook knows, that’s a sign of a very good recipe. Yum! My birthday is coming up and this just went on my short list of birthday cake requests! 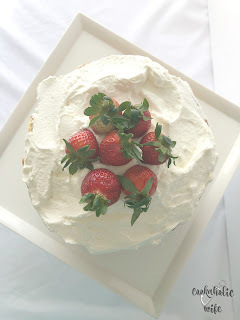 I think layer cakes are so pretty- with strawberries and cream, this is just perfect for Spring! I love that there are no other pictures- means it was delish! This is my kind of dessert Nichole. Sounds delicious. That's a delicious looking tower! Perfect for Easter! Ohhhh!!! This cake. Drooling over it. 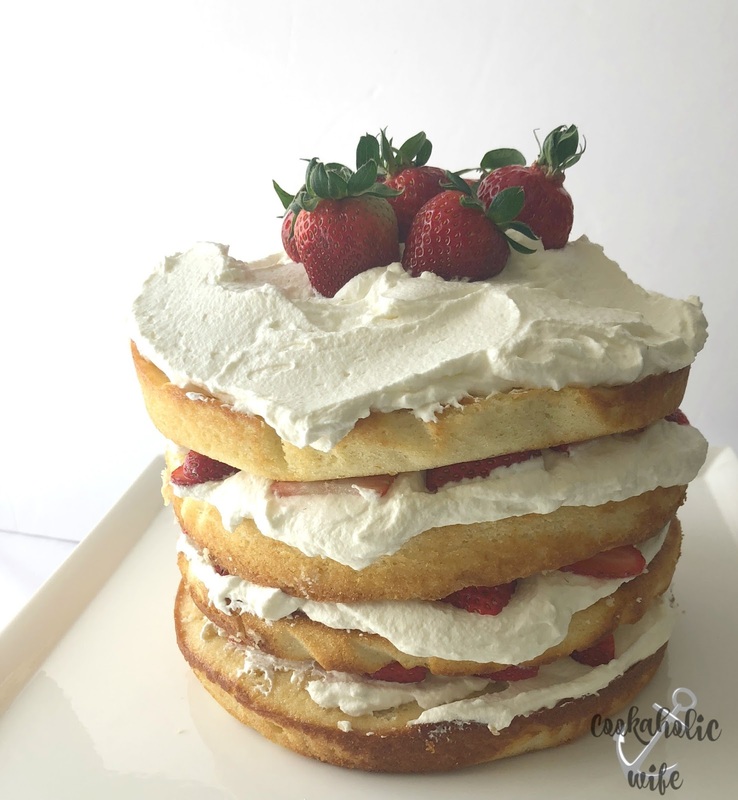 Love the layers and with the homemade whipped cream, no one is going to dock you on the boxed cake! I'd use a boxed one myself! Pinning. I prefer strawberries raw too. When I was a kid, we had around 50 strawberry plants and it took all the self control I had not to eat them while I picked them. This layer cake looks beautiful and SO YUMMY! !